Heart and Sole: Prove it! If I'm going to hike the AT end-to-end twice in 2012, as I hope, I want to be able to come away with some solid proof that I did it. I guess I'm a bit obsessed with that. I've been on the trail and seen other thru-hikers, who are clearly not purists, taking short-cuts. I want to pass every white blaze, and to the best of my ability I want to be able to prove it! With today's high tech capabilities, it seems to me that it ought to be possible to prove 'beyond a reasonable doubt' where I walked and when I was there. To collect the data necessary, I'm relying on my new toy, the Garmin Oregon 550 GPS with camera. But collecting the data isn't enough. My goal has been to make it available on-line. I've now finished exploring the options to do that, and have come to the realization that I'm just not tech-savvy enough to do everything I know is possible. Unfortunately it seems that one needs to be familiar with the internal workings of KML files on Google Earth and/or GPX files generated by the Garmin unit. I just don't have time or inclination to dive into the deep end of that pool right now. But I've got the basics nailed. Yes, I *can* prove where I've been. 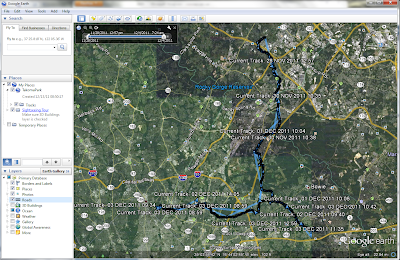 To get technical about it, what I can do is save the tracking information from my GPS unit to my computer and, using the Google Earth application (which you have to download from Google), convert the tracking data to a KML file for display. The image is the resulting raw display--I've yet to try to customize it or tinker with it. But I don't really have to. The point is that I can save the track data and I can share the KML files with anyone who wants proof so that they can view them on Google Earth for themselves. What I cannot do (yet) is embed the photos I took with the GPS into this tracking information. Nor can I find a satisfactory way to take the Google Earth Track and display it in user-friendly fashion on Google Maps (the 'My Maps' option nominally lets me do that, but for all practical purposes it's far too clunky and inadequate). Google Earth, on the other hand, seems pretty amazing. If you want to view my track files, it seems by far the best choice. I've only just begun to explore what I can do with Google Earth, but knowing I've got the basics necessary to provide documentary proof of my hike is good enough for now. I'd recommend that anyone who likes 'virtual travel' try downloading Google Earth, then you can come along with me virtually, step by step, on my epic journey. If only you could seamlessly see the photos I've taken along the way as you fly along my Google Earth track! I tried embedding a test photo, but my attempt failed miserably. So for the time being I've had to go to the separate Google mapping application to display my photos: called Panoramio. There I have downloaded my photos from the Takoma Park-Savage-Goddard hikes and had them automatically mapped. If only that automatic map on Panoramio could also include my track! Grrrrr! I just can't seem to make these different Google applications work together. It's probably me - and my lack of tech-savvy skill. But time is ticking--less than three weeks to go now until I hit the trail--so I'm going to have to settle for this compromise. And that's good enough. My mind is at ease ... got my gear ready (maybe I'll post a summary of that), got my supporting tech equipment ready, got my attitude focused, and got my body just chomping at the bit to start. AT here I come!